Security is critical in government networks. The emergence of carrier-grade Ethernet standards has given network operators the ability to introduce segmentation and provide enhanced security. 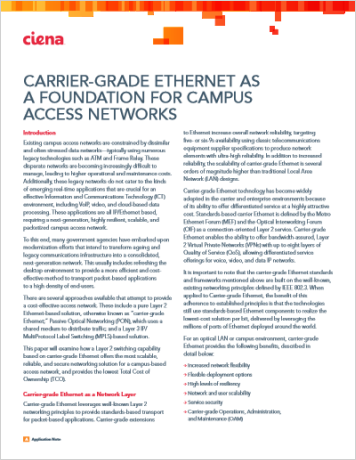 This paper examines how a Layer 2 switching capability based on carrier-grade Ethernet offers the most scalable, reliable, and secure networking solution for a campus-based access network, and provides the lowest Total Cost of Ownership.